Dinky Poppy is a wonderful, small girl who is desperately seeking a new home with all those lovely cosy comforts. She is currently in the care of Foal Farm Animal Rescue in Biggin Hill, Kent. 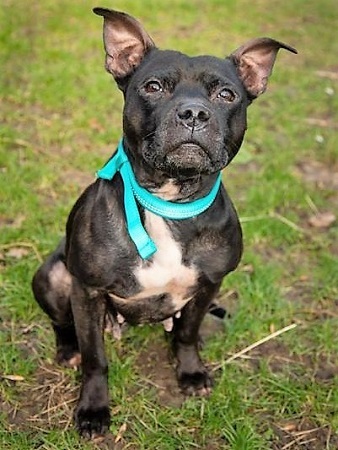 Poppy is 9 years old and is a healthy, neutered Staffordshire Bull Terrier who is full of life even though she is an older lady. This diddy girl would do well in a fairly active home. She loves people but can get slightly over zealous with her toys, so a teenager upwards home or an adult home only please. Poppy is a loving girl who needs a home with a calm routine. Although she happily walks with other dogs, she would prefer a pet-free home given her possession issues, especially when she is on the sofa, so a sensible and patient adopter needed. Please mention that you saw Poppy on the Oldies Club website.